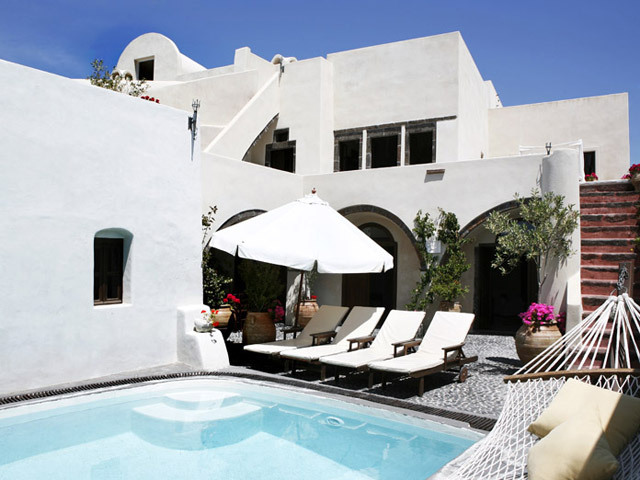 Built in 1878, this graceful traditional two storey Santorini Mansion is located in the heart of the picturesque village of Megalochori. At the turn of the century the first floor would have been occupied by the family with the ground floor serving as the winery and cellar. The original structure has been sensitively renovated, and has been restored to its original splendour, retaining the original layout and traditional features. Mansion 1878 consists of two spacious self-contained units with a private pool and is tastefully decorated with fine antique pieces of furniture. From the village square a winding footpath leads you to the Mansion. Mansion 1878 is situated in the traditional settlement of Megalochori. The villa is reached on foot along a footpath. A 100 meter walk from the central square of the village. *View: Private enclosed garden with partial view of village & church towers. 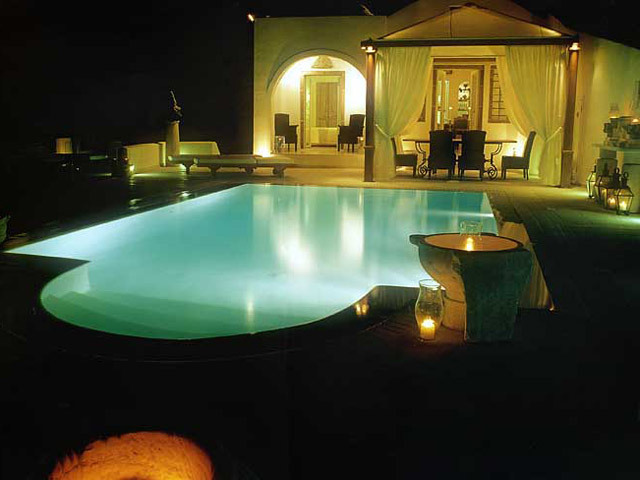 Enter into the large cobbled private courtyard, complete with pool. 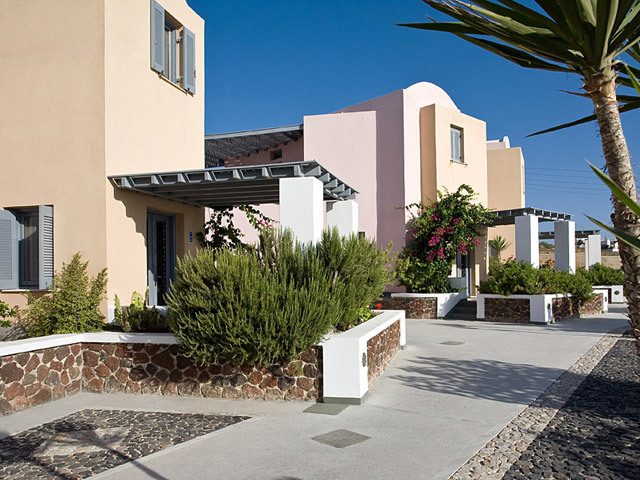 A stone stairway leads you to the first floor with large terraces and panoramic views of the village. The first floor consists of a traditional styled kitchen, well equipped with modern appliances, which leads into the large dining room. The original wooden floors and vaulted ceiling add warmth and character to the interior and is perfect for entertaining. A comfortable lounge adjoins the dining area. The spacious master bedroom is comfortable, bright and airy. A carved stone staircase leads to a private landing and second large double bedroom. An attractive bathroom with wood and stone features services both rooms. The ground floor once served as the 'canava' - wine cellar and workshop - of the Mansion. Carved into the rock face every aspect of this Mansion is unique with heaps of character. The cylindrical troughs sunk into the ground, once used for distilling the visanto, provides unusual lighting features to the interior. Three large barn-style doors lead from the cobbled courtyard into the various living areas. The smooth-edged carved interior provides a cool and relaxing haven during the hot summer days. The well equipped traditional-style central kitchen leads into the beautifully lit dining room, perfect for leisurely meals with friends and family. Arched doorways on either side of the kitchen allows for an easy flow through the house. The large comfortable lounge is well appointed with a large screen television. On the opposite end of the canava is a spacious sleeping area allows for two double bedrooms with a shared seating and dressing area. The shared extravagant bathroom has a large shower, seating area and large vanity. A few steps away from the attractive pool you will find a separate spacious double room with en-suite shower room. Large families or a group of friends that may require two independent properties will find this the perfect solution without compromising privacy and comfort. This Mansion can accommodate up to 10 guests. 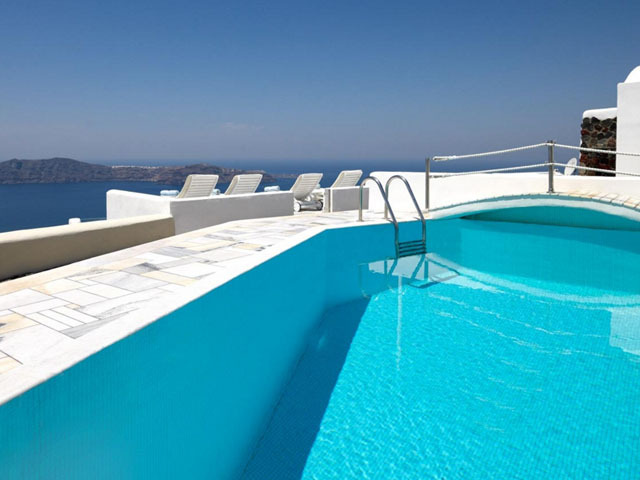 Bed linen, towels, pool towels, bathrobes, slippers and “Mastic” guest amenities provided. A la Carte breakfast and meals delivery in the villa, prepared by the traditional restaurant Raki which is located at the square of the village, upon request.